Pertaining specifically to the first story in the series. PERFORMANCE ANNOUNCEMENT: Mrs. Hawking and Vivat Regina at the Watch City Steampunk Festival! Mrs. Hawking and Vivat Regina are returning this May! Missed our part one, Mrs. Hawking? Haven’t yet gotten to see part two, Vivat Regina? 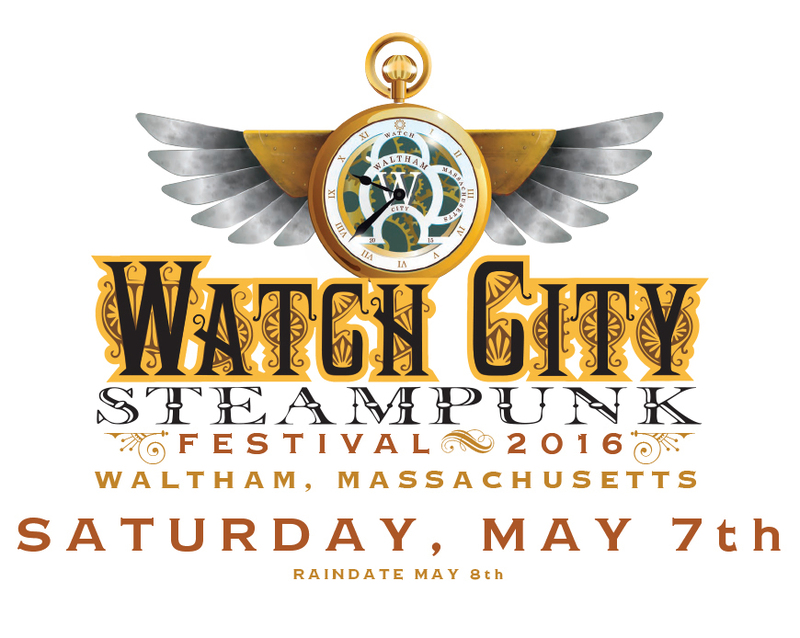 Our continuing adventure stories will be back as guests of the Watch City Steampunk Festival 2016, Saturday, May 7th, in Waltham, MA! This event is free and open to the public, so there will be no cost or barrier to come out and join us. Additionally, the Festival is full of food, vendors, panels, and other entertainment events to make it especially worth your while. More information will be available soon, but in the meantime, put May 7th on your calendars as your next chance to catch the adventures of the Lady’s Champion of London! 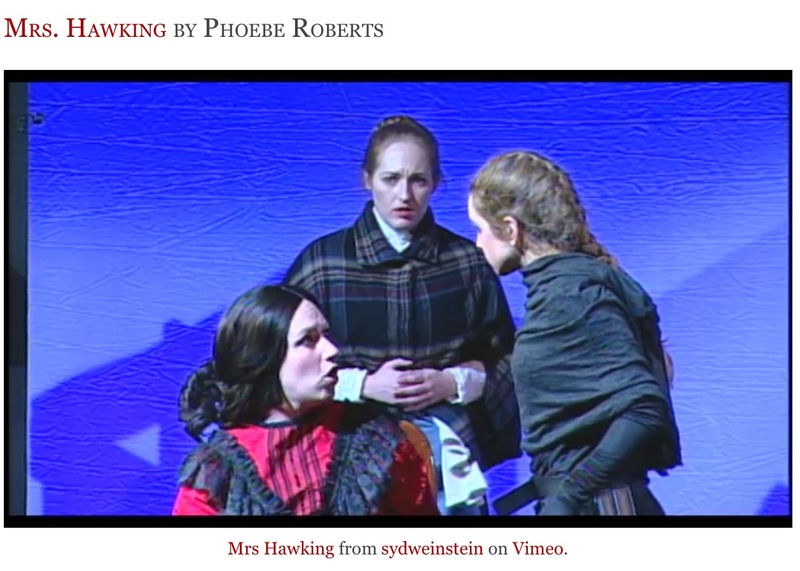 The more I developed the Mrs. Hawking stories, the clearer it’s become that they’re probably not absolutely best suited to be plays. They are action-heavy and spectacle-focused, and as they grow in cast size and scope, it seems more and more that they would be best suited to some kind of cinematic format. I’ve heard many responses from audiences confirming this. Right now, producing them on film is beyond my capability, so for the moment I’ve been getting them out as theatrical plays. But I know someday I’d like to work toward some kind of serialized televisual medium. I’ve been starting to explore what options might be viable to someday take the work in that direction. Producing a web series in installments seems a possibility worth investigating, but also preparing for any opportunity to pitch it to real production companies. To that end, to be prepared to take advantage of any chance of that nature, I decided it was finally time to take a stab at adapting the tale, or at least the beginning of it, to the screen. 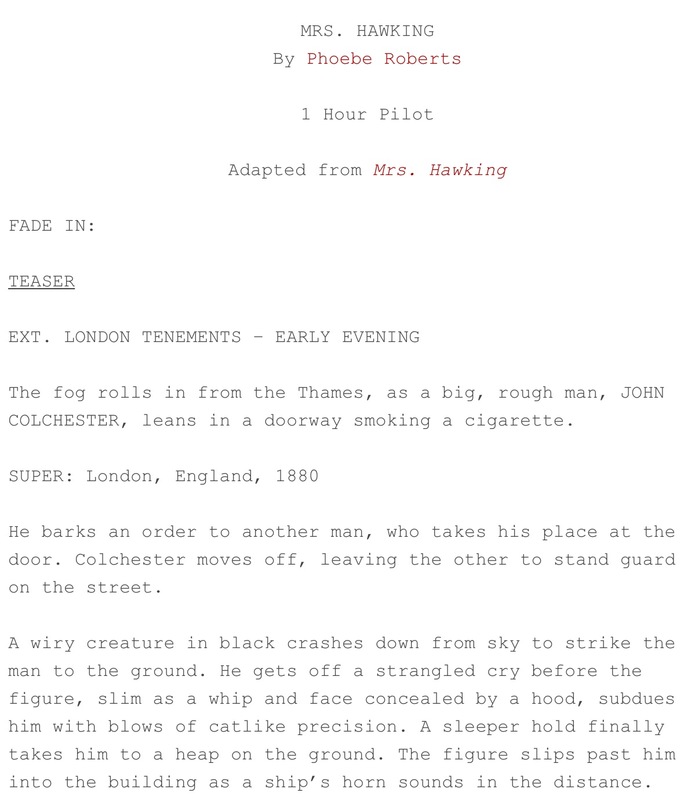 At long last, now Mrs. Hawking’s first story is available to read in the screenplay format. This piece is basically a reimagining of the plot of the first play Mrs. Hawking to fit the hour-long American television drama format. This was developed based on excellent feedback from John Benfield, Charlotte Brewer, Nat Budin, Viktoriya Fuzyalova, Matthew Kamm, Tegan Kehoe, and Shannon Moore. I’m so grateful for their input, as discerning eyes in the writing process helps me improve my work so much. As a pilot, this is probably not a strictly ideal production example. In the context of a series, a pilot should set up the leads and their circumstances and prime the audience’s interest to see more. This version may give away a bit more of the drama that may belong in a pilot, rather than ration it out to set the pace for future episodes. But this is strictly a kind of audition piece, designed to be considered in isolation to demonstrate the potential of the series. Choices were made in this adaptation to not only whet a reader’s appetite for further stories, but also to pack enough narrative punch to make this one installment satisfying on its own. It would have to be adapted and reedited to work better in the context of a full season of episodes. But consider this new pilot version not only an audition of the work but a test, to examine the potential of Mrs. Hawking in another medium. I think it brought a lot of excitement and color that couldn’t be represented with the limitations of the stage. Why don’t you check it out to see what you think? Performance times for Mrs. Hawking and Vivat Regina! We have been scheduled for times and locations for our upcoming performances at Arisia 2016! Go here to sign up to attend Arisia 2016! Be sure to join us for the continuing story of the lady’s champion of London! London, 1880— When Mary Stone accepts a job as housemaid to a fierce, brooding society widow, she is drawn into Mrs. Hawking’s heroic crusade as secret champion to society’s downtrodden ladies. Join us for this Victorian action caper, and explore what would happen if Sherlock Holmes were more like a lady Batman. London, 1881— The continuing story of the lady’s champion of London! Mrs. Hawking is stern in training her new assistant, housemaid Mary Stone, in the art of society avenging. But when a mysterious lady under a false name brings them an impossible mission, our heroines must join all their varied strengths together to see justice done. The sequel to Mrs. Hawking, but requires no knowledge of the previous play. 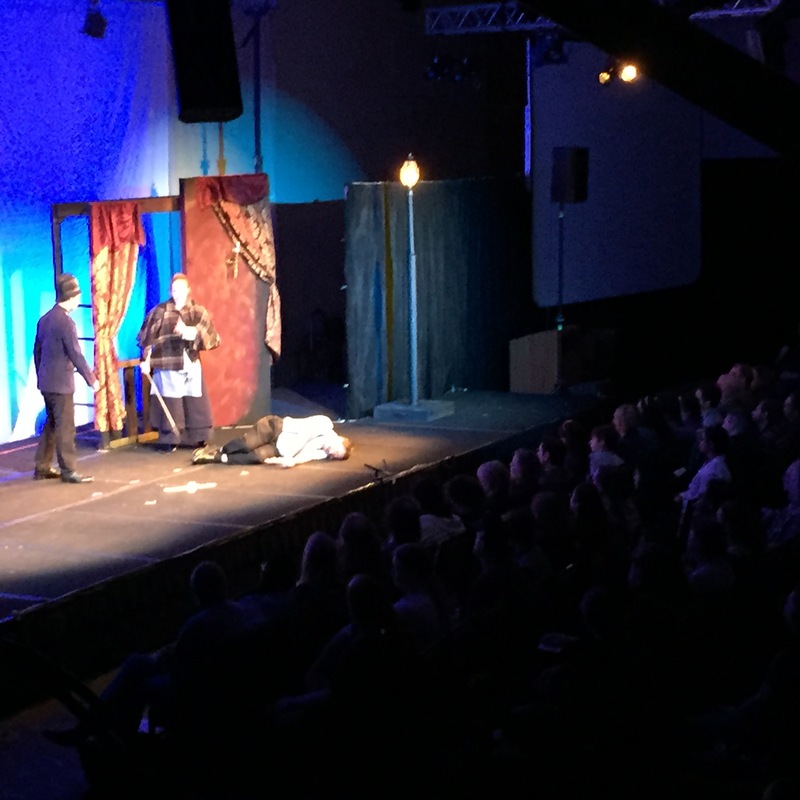 For our double-header performance at Arisia 2016, we needed a serious cast and crew! I’m happy to say we’ve found them. For the two plays, we are very lucky to have many actors returning from previous performances and iterations of the Mrs. Hawking stories. For Mrs. Hawking, our first installment, the majority of the cast is a veteran from a previous full production, whether our original at Arisia 2015 or the encore at the Watch City Steampunk Festival later that year. This gives us a great advantage in producing this time around, as most of the cast already know their roles well and won’t require a ton of work to whip the show into shape. As for Vivat Regina, we have of course our three leads played by the same actors as they will be in Mrs. Hawking– Frances Kimpel, Circe Rowan, and Jeremiah O’Sullivan. 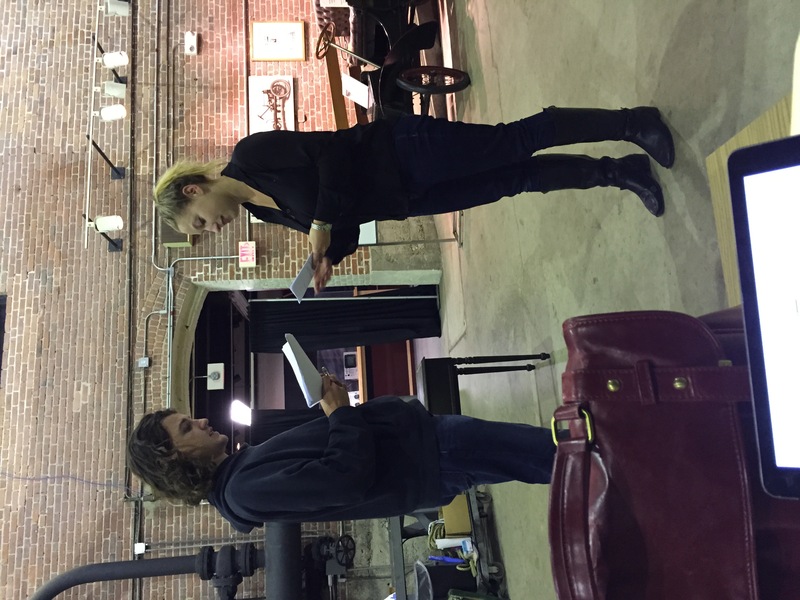 But much of the additional cast are veterans of the Vivat Regina staged reading, with Joye Thaller, Samantha LeVangie, and Matthew Kamm all reprising the roles they read. While this will be an entirely new rehearsal process, it’s a great blessing to work with actors who know their characters so well. And of course there’d be no show without the crew. The talented technical artists who helped bring Mrs. Hawking to life previously will be returning to bring the same magic to Vivat Regina. We are becoming quite the little troupe! 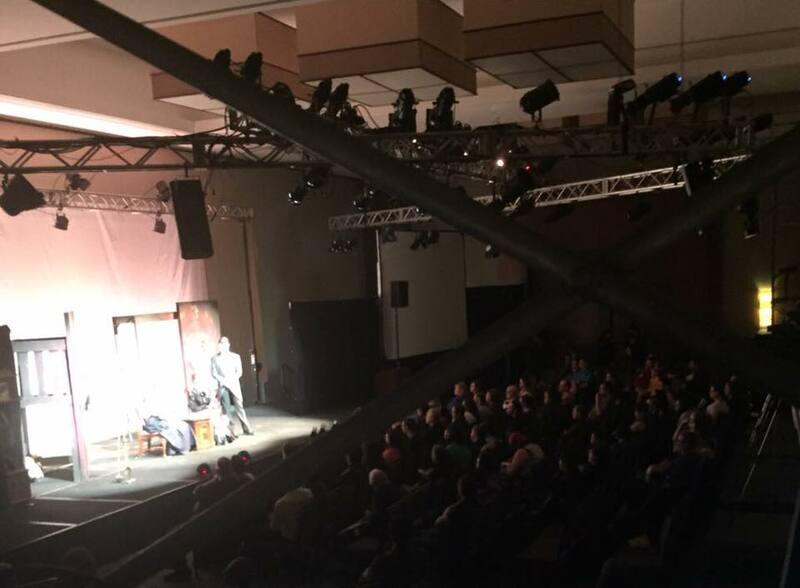 Any theater project, not to mention any one so large and experimental as serialized live shows, requires a lot of great people to bring together. I am so honored to have so many talented people signing onto the project. Watch this space to see everything they bring to the process! 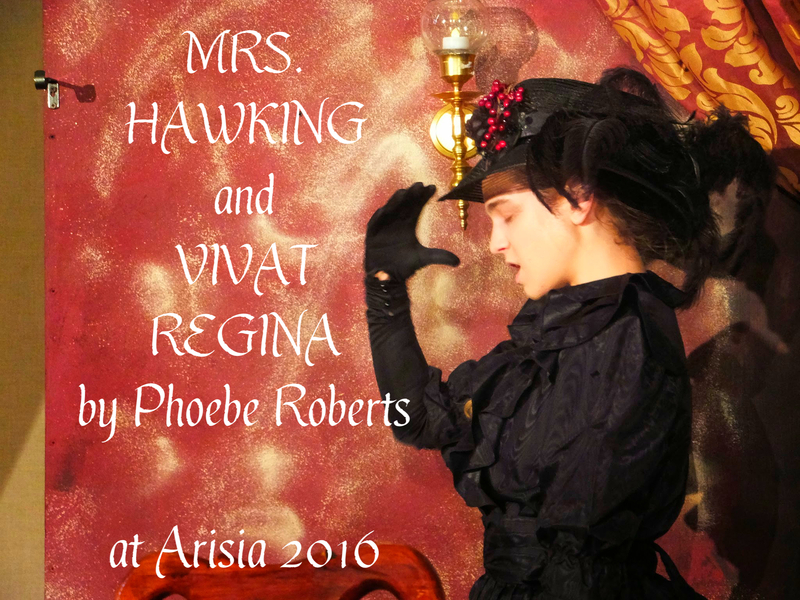 PERFORMANCE ANNOUNCEMENT: MRS. HAWKING and VIVAT REGINA to go up at Arisia 2016! We are officially announcing it! 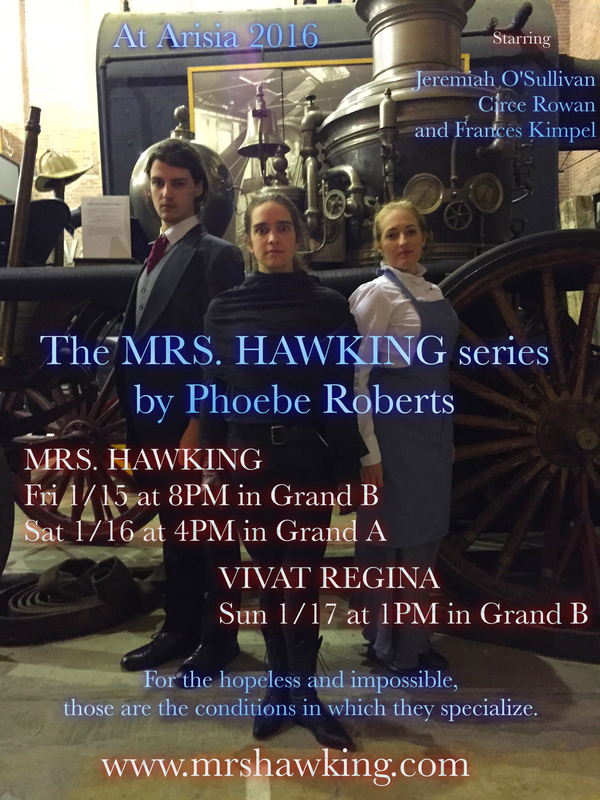 The first two shows in our series, MRS. HAWKING and VIVAT REGINA, will be performed in the course of events at Arisia 2016! Mrs. Hawking is returning to the event where she saw her performance debut, but this time, she’s going even further. This marks the beginning of an exciting experiment in actually producing serialized theater. One rarely sees live performances that build upon what happened in the course of a previous story. But the Mrs. Hawking series, with its ongoing plot and characters, is breaking down that barrier. We will be putting together and rehearsing the two shows in tandem with each other, creating a consistent through line of narrative and character development for the audience to enjoy. 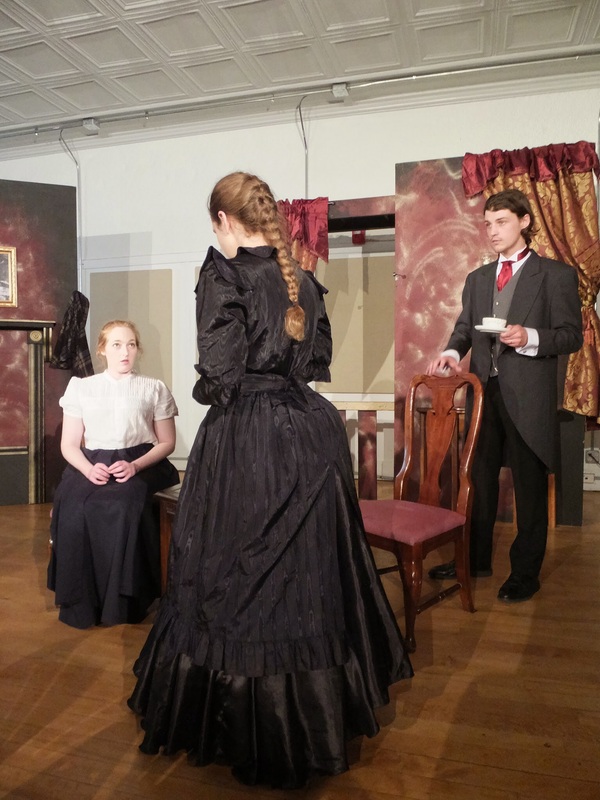 We have assembled two excellent casts, with some new and some returning actors, to populate the world, including the recurrence of our three leads, Mrs. Hawking, Mary, and Nathaniel. This will afford the audience the rare chance to see live storytelling with greater scope of character development than just a single plot can allow. It’s going to present some new and interesting challenges, and will involve some figuring things out as we go. But the chance to show a continuing theatrical story, where characters grow, develop, and change based on events that happen before the audience’s very eyes, is too exciting to pass up. Come join us for this unprecedented event in live storytelling, and see where our heroes journey will take them on the next step!